There are many reasons to have to have limited time at a national park: Difficulty getting time away from work, financial constraints; traveling with children, even just lack of time. But even if you just have one full day, you can do and see a lot at many parks, including Acadia National Park. You know you have one day and now you will only need to remember one name: Mount Desert Island, where the majority of the national park is preserved. Once a continental mainland towering with glacial ice sheets, it is now a lake-filled, mountainous island full of attractions and wildlife. For one day on this island, plan to get up very early… you will be happy you did. Once you are awake, grab your much-needed coffee and breakfast and head to the top of Acadia’s most popular attractions—Cadillac Mountain. Those driving will have no problem on the ​3.5-mile road, equipped with parking. Look for Summit Trail which will lead you to the top of the highest east coast mountain north of Brazil. What better way to see the sun rise? On your way down, there are two worthwhile stops which will highlight the historical importance of the park. The first, Sieur de Monts Spring Nature Center, is open from June thru October. The Sieur De Monts Spring is a memorial to George B Dorr, one of the most influential people in the creation and preservation of Acadia National Park. The nature center gives you an understanding of the ​inhabitants of Mount Desert Island. The second stop is the Wild Gardens of Acadia. Browse 300 native plant species that have been organized into nine display areas and labeled for easy identification. The garden is open all year-round. The entire area is also home to the Abbe Museum which showcases Native American culture and its history in Maine. This can’t-miss attraction literally allows tourists to experience the force of the sea around. Thunder Hole is a small inlet that has been naturally carved out of the rocks. The waves roll into the inlet and approach a small cavern at the end. When the intense rush of the wave arrives, air and water is forced out like a clap of thunder—hence the name. Water sometimes shoots as high as 40 feet with a thunderous roar! Visit the west side of the island to get in some swimming. Around Southwest Harbor you will find Somes Sound which has been described as the only fjord in the US. This body of water contains depths up to 175 feet and almost splits the island into two. This beautiful body of water will definitely do one thing—get you in the mood to swim. So grab your towel and look to the right. Here, you will find Echo Lake, a wonderful spot to swim and lounge on the small beach. If you can't make it to the west side, check out Sand Beach. It wouldn’t be a vacation if you didn’t dip into the water at least once! 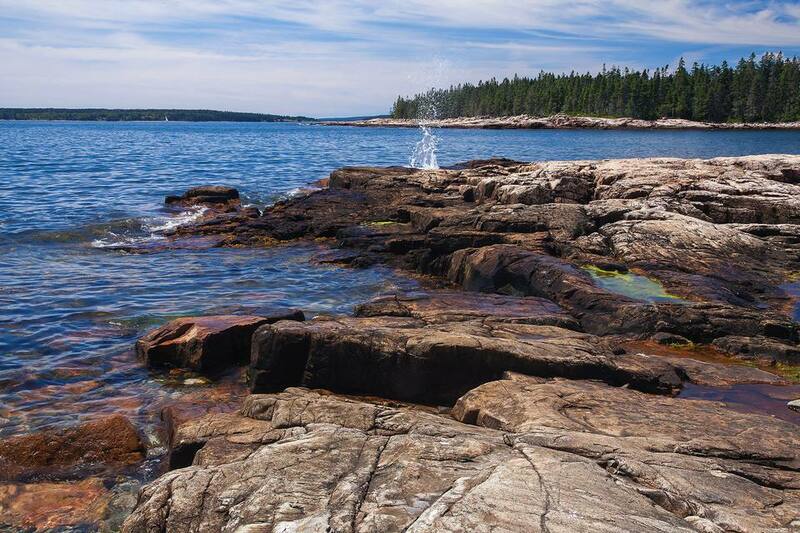 The park’s most iconic feature is located at Bass Harbor Head. Here you will find the 19th-century lighthouse named after its location. Bass Harbor was well-traveled and the light was needed to guide vessels. In 1858, Bass Harbor Head was built to warn mariners of the Bass Harbor Bar at the eastern entrance to Bass Harbor, and also to mark the southeast entrance to Blue Hill Bay. The 32-foot high construction is attached to a house that was used by a single keeper and his family. Since its creation, there have been 13 keepers and in 1957, the station became a home to a Coast Guard keeper and his family. End the day with a picnic at Pretty Marsh. The densely forested area is located on the shore facing Bartlett Island and Western Bay and contains picnic tables spaced apart enough to give a secluded experience. Surrounded by elder evergreens, moss, and new growth, you can wind the day down with the sounds of woodland creatures chirping and the lapping of ocean waves. It will feel like a long day at the end of your journey, but a great one nonetheless. Remembers at all locations are equipped for short hikes or bike rides. Maine is one of the most scenic areas to visit with its stunning forests and vast ocean views. Whether you visit alone or with others, be prepared for a peaceful experience.